While an express trust can be a useful family agreement, it can be vulnerable on many fronts to attack or compromise from those outside the family. It is particularly vulnerable to professional members of the real estate, legal and/or healthcare communities who become aware of and manage to gain access to the family trust agreement. Fraud and unscrupulous professional practices can breach the protections established by the family members and make off with the family’s principal assets, the real property placed in the trust estate. The Santa Fe TRUST had such vulnerabilities and they were exploited by both legal and end-of-life healthcare professionals operating in Santa Fe, New Mexico who were able to take advantage of newcomers from the midwest. Litigation in five separate court cases since 2002 has uncovered clear evidence of six separate covert acts by legal and healthcare professionals between 1992 and 2002 to subvert and violate the family trust for their own long term advantage to the detriment of the intended family beneficiaries. The Santa Fe TRUST had such vulnerabilities and they were exploited by both legal and end-of-life healthcare professionals operating in Santa Fe, New Mexico who were able to take advantage of newcomers from the midwest. Litigation in five separate court cases since 2002 has uncovered clear evidence of six separate covert acts by legal and healthcare professionals between 1992 and 2002 to subvert and violate the family trust for their own long term advantage to the detriment of the intended family beneficiaries. #1. Nurse Violates Professional Ethics: the hospice nurse assigned to provide end-of-life care to the wife in 1992 violates bedrock healthcare ethics by failing to break off relations with the husband after the wife’s death. #2. Nurse Compromises Surviving Co-Settlor: during 1993, 1994 and 1995, the hospice nurse develops a personal relationship with the widower/husband cutting off his relationship with his children and step-children. #3. 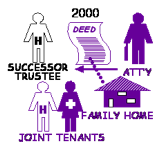 Inherited Land is Transferred to Nurse: invoking the husband’s powers as successor trustee, title to the inherited land in the trust estate is transferred to the nurse in violation of the TRUST Agreement. #4. Deceitful Legal Advice is Issued by Law Firm: in 1999 and 2000 an established Santa Fe law firm deceitfully and secretly advises the husband (and successor trustee) that the TRUST Agreement allows transfer of the family home to the nurse. #5. Survivor’s Estate Legally ReConfigured: in 2000 this same law firm reworks the widower/husband’s will establishing the hospice nurse as the personal representative of his estate. 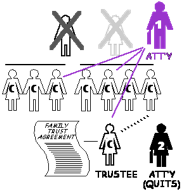 The TRUST Agreement itself is revised and amended (although no copy of this amended agreement has been obtained as yet). #6. Family Home is Transferred to Nurse: finally later in 2000 the Santa Fe law firm drafts a warranty deed transferring the family home from the TRUST to the nurse and husband as “joint tenants” in violation of the TRUST Agreement . The firm gets the husband/trustee to sign the deed, witnesses it, and files the deed with the county recorder. The transfer is kept secret from the children-beneficiaries and is made without their written approval. Three other covert acts necessary for the trust violations above apparently occurred in 1992 prior to the death of the wife: (i) one or more professionals outside the family gained access to the full terms of the TRUST Agreement, (ii) someone caused the first hospice nurse assigned to the family to be replaced by the nurse who later set up and benefited from the property transfers, and (iii) someone arranged to have the “corporate trustee” removed from the TRUST Agreement just prior to the wife’s death.